Dear KOM-ers! We’re so happy to feature a new book giveaway! Please enjoy this excerpt from “Next Act, Give Back” by Kirsten Bunch. International Bestseller “Next Act, Give Back” was written for the person who wants to get serious about playing her part in creating healthier, safer and more equitable communities. If you have been thinking about how you could devote the next phase of your life to making a difference, whether through a new career or a total reinvention of yourself, this book will transform your life. I know what it’s like to see a human being suffering and to do nothing. Not because I didn’t care. Because I didn’t know what to do and I didn’t believe that I had the power to do anything. We were in Afghanistan doing some leg work for a women’s economic development project. The goal of the project was to help women build businesses so that they could have an income and could feed their families, send their kids to school and in general, have more control over their lives. A woman wearing a blue burka approached me. I hadn’t interacted much with a lot of women during the short time I had been in Afghanistan and it felt pretty foreign to me to have this woman who was completely covered from head to ankle, with a mesh square surrounding her eyes, approach me. She put out her hand to ask for money. A baby lie in her arms, probably six or seven months old. The baby was nothing but a skull. His cheeks were sunken and his eyes appeared too big for his face. Her child was starving to death. She was probably starving to death, too. I looked at the woman and then at her baby, and I kept walking. I didn’t do anything. I didn’t give her anything. I didn’t help her. I was afraid of her. I was afraid of the baby. I was afraid of what the woman and her baby told me about myself. That I was powerless to help her. I thought she was asking me for what I couldn’t give. I could have given her money. I could have bought her food. What I couldn’t give her was the life that she deserved. The life where her baby was healthy and strong. The life where she spent her mornings at home laughing as her baby played in the morning sun that filtered through her kitchen window. I felt powerless to help her because I didn’t know how to help. Who was I to help this woman? What did I know about her situation? What did I know about what she needed? What right did I have to think I could do anything to help her? I wrote this book because I believe if someone had said to me in 2006 when I met that woman and her baby, “Kirsten, you don’t have to keep walking. You don’t have to be ashamed or afraid that you don’t know what to do. It’s normal to wonder if you have any power to change that woman’s life. I assure you, you do. Let me show you how.” I would have done something to change her and her baby’s life and changed my life in the process. * By entering this contest, you give consent to Kind Over Matter to use your name for promotional purposes on our website and on all social media. 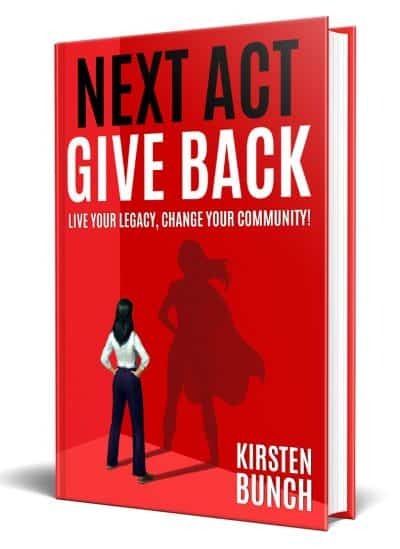 Kirsten Bunch is the author of the international bestselling book "Next Act, Give Back." After a 20-year career in global development, where she fund-raised over $20 million and designed and managed social change programs in 10 countries, Kirsten reinvented herself and invented The Women's Changemaker Mentorship™. This is a one-of-a-kind program that propels successful women to become Changemakers in their communities. Her clients find deeper meaning and fulfillment in their lives through a more profound connection with their community. Many of her clients start heart-centered businesses, organizations and passion projects that create healthier, safer and more equitable communities.